Olympiacos Piraeus overcame injuries to grab its 10th win in its last 12 Turkish Airlines EuroLeague games by downing Unics Kazan 75-90 on the road on Thursday. 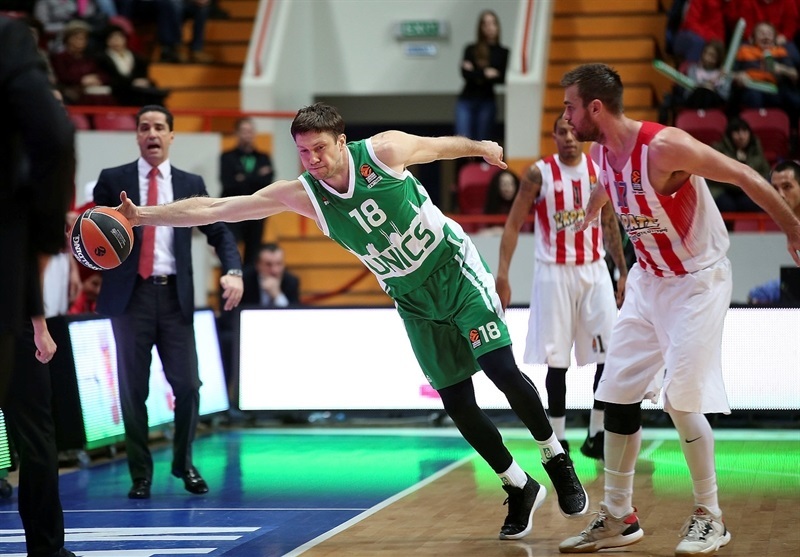 Olympiacos improved to 15-6 in the standings, while Unics dropped to 7-14. 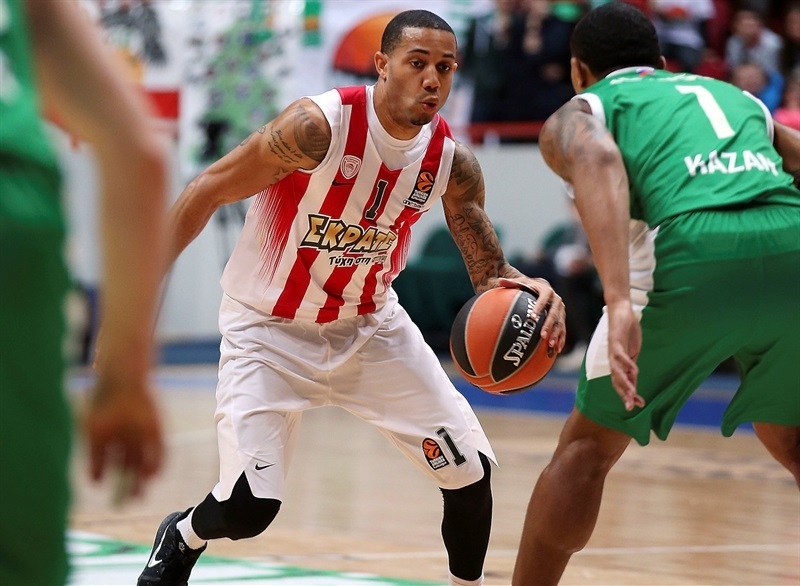 Erick Green led the winners with 25 points, Georgios Printezis added 20, Nikola Milutinov had 11 and Kostas Papanikolaou 10 for Olympiacos, which was without the injured Vassilis Spanoulis, Patric Young and Matt Lojeski. 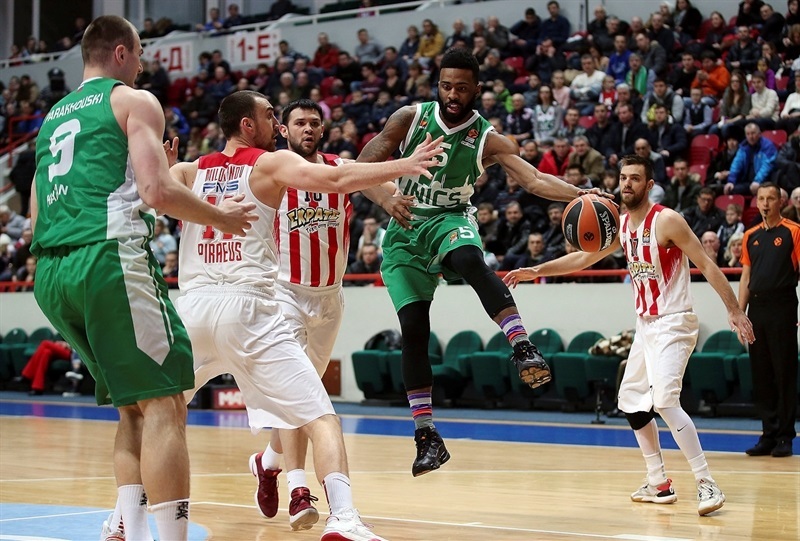 Keith Langford led Unics with 25 points, Pavel Antipov added 19 and Art Parakhouski had 14 for the hosts, who were without playmakers Quino Colom and Anton Ponkrashov. Olympiacos had a near-perfect start, hitting 7 of its first 10 two-point shots and going 9 of 12 from downtown. It tied a EuroLeague all-time record by getting a 20-point margin after 10 minutes (13-33) and extended it to 16-43 early in the second quarter. At halftime, Olympiacos had outrebounded Unics 9-18 with more offensive rebounds (6) than its opponent's defensive boards (4) in addition to 12 assists and having made 10 of 15 three-point shots to get a 36-56 margin. 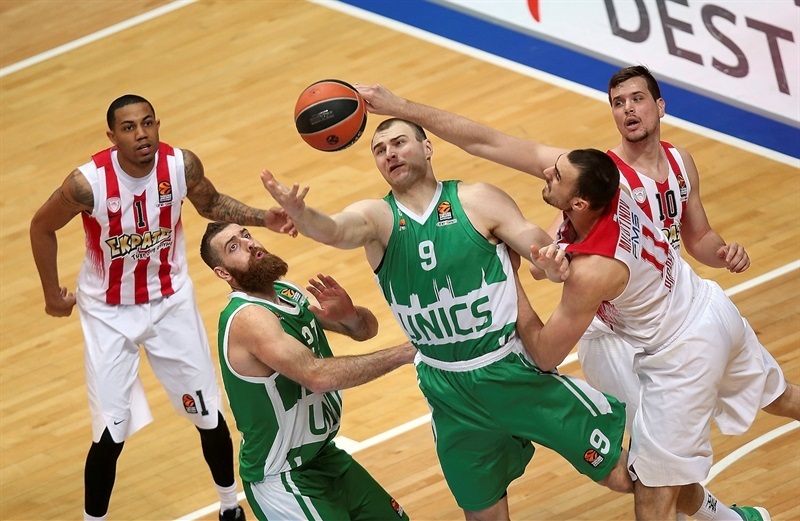 Unics improved in the second half to get within 61-69 in the fourth quarter, but Printezis showed great leadership in crunch time and made the critical baskets Olympiacos needed to keep full control of the game. In the end, three-point shots (14) and offensive rebounds (12) made the difference for the Reds. Printezis and Papanikolaou got Olympiacos going with consecutive jump hooks. Vangelis Mantzaris and Green each struck from downtown right after that for a 4-10 lead. 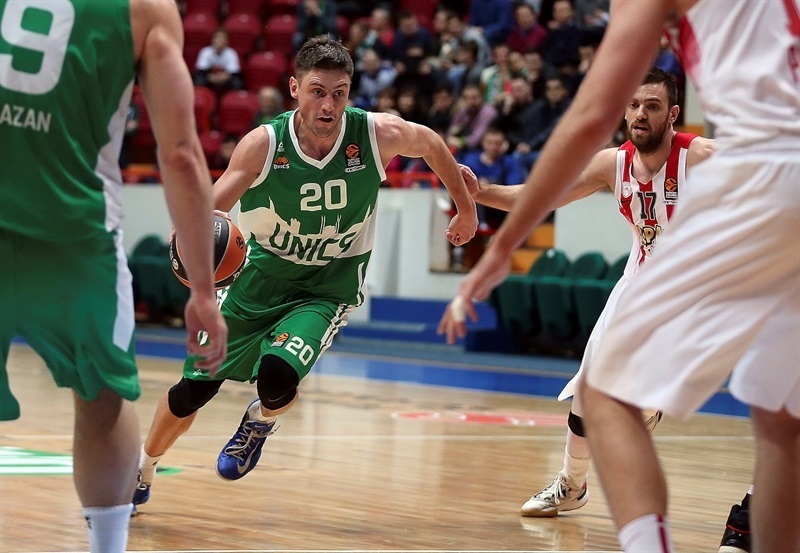 Kostas Kaimakoglou and Vadim Panin stepped up for Unics, but Milutinov followed a jumper with a put-back slam and three-pointers by Papanikolaou and Mantzaris made it a double-digit margin. 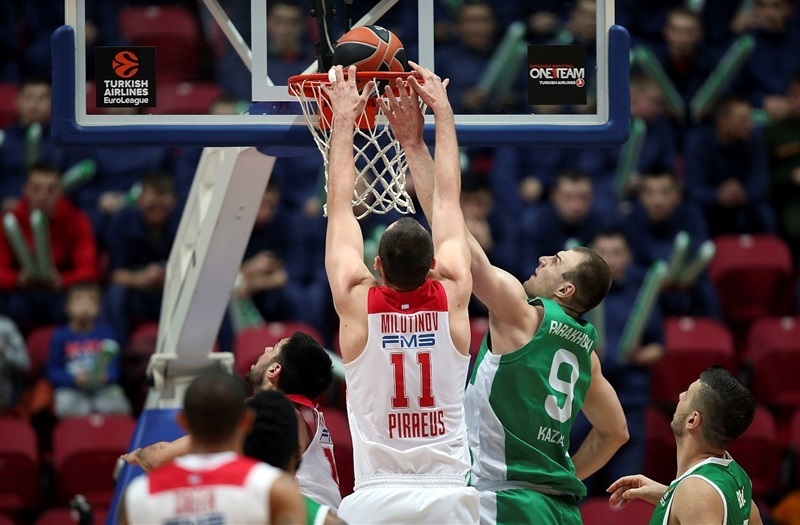 Papanikolaou and Printezis each buried a shot from beyond the arc to make it a 20-point game, 13-33, after 10 minutes. Dimitris Agravanis also hit a triple to cap a 0-14 run early in the second quarter. 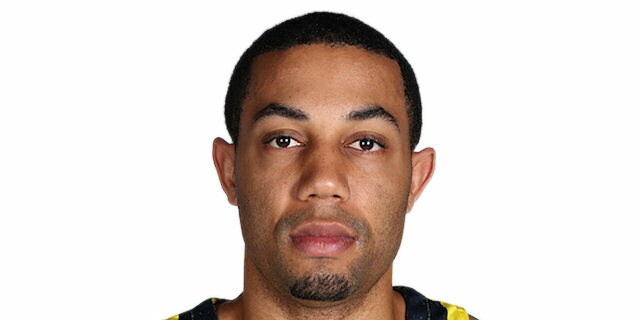 Antipov joined the three-point shootout, but Green and Dominic Waters boosted Olympiacos's lead to 16-41. 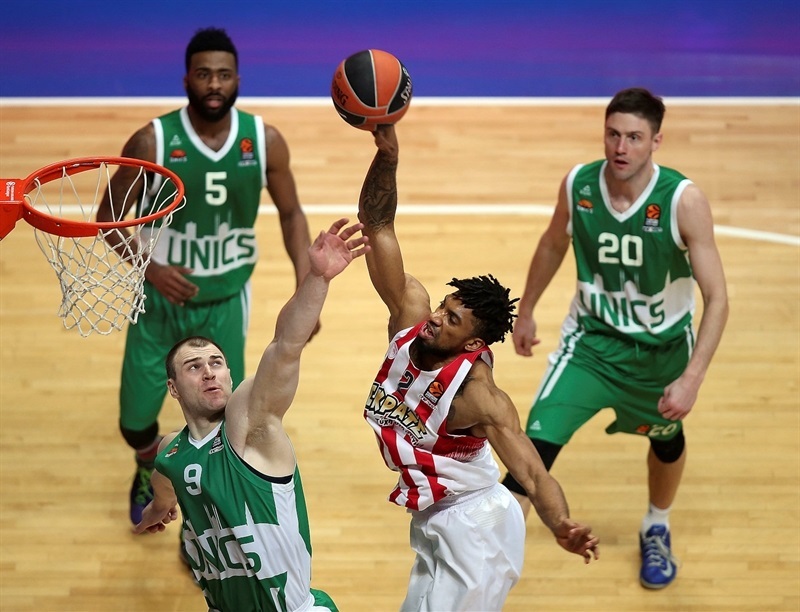 Khem Birch shined over with a wild alley-oop slam, but Parakhouski and Langford brought Unics a bit closer, 26-45. 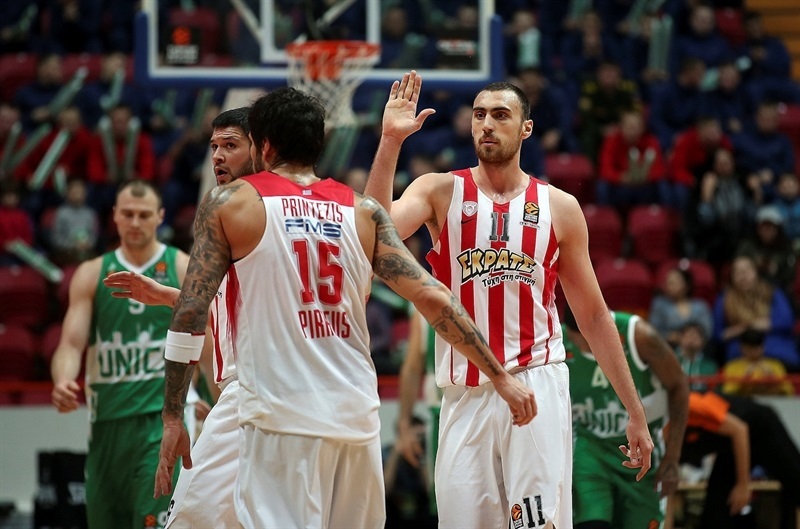 Printezis rescued Olympiacos and got plenty of help from Green and Milutinov to establish a 36-56 margin at halftime. Langford followed a layup with a triple right after the break and a layup by Parakhouski gave Unics hope at 43-58. Green remained unstoppable, but Langford had 4 points in a 6-0 run that brought Unics closer, 49-63. 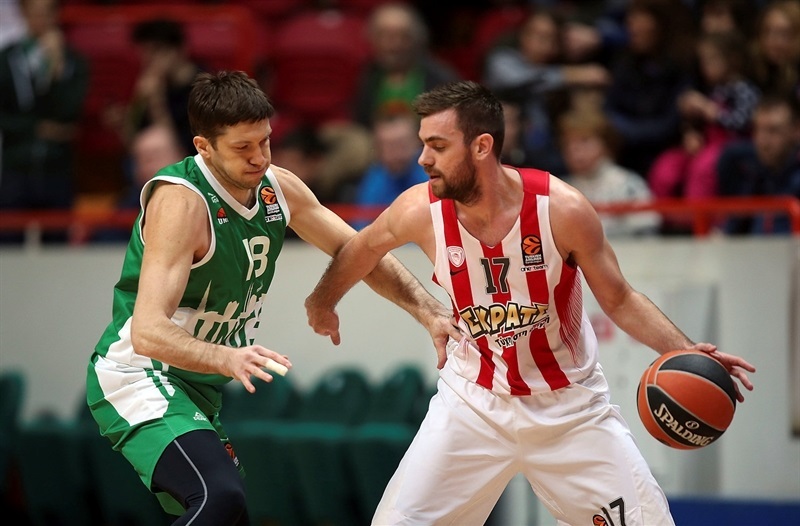 Kaimakoglou hit free throws and Marko Banic nailed his trademark baseline jumper, but Green hit a couple of jumpers to give Olympiacos a 54-69 advantage after 30 minutes. 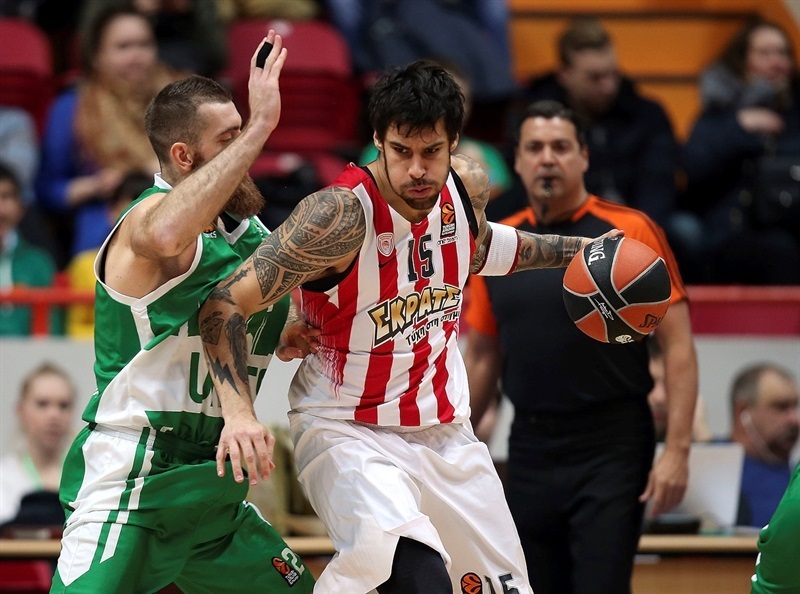 Olympiacos kept struggling to score early in the fourth quarter. Meanwhile, Orlando Johnson scored down low, Parakhouski made free throws and a big triple by Langford prompted the visitors to call timeout at 61-69. Printezis and Milutinov stepped up in crunch time and free throws by Papanikolaou made it a 12-point game, 65-77, with four minutes left. Printezis struck twice from downtown and added a fast break slam that sealed the outcome, 68-87, in the next-to-last minute. "I think we had a bad start of the game. Our first quarter was awful, we let them lead by 20 points. We prepared for this game and worked for it, but Olympiacos came out physically strong and always play close to making a foul… They use their elbows and grab, but we have to be ready for that. But we were not. We were one step back. We were not afraid of contact, but did not play physical enough. They scored 33 points in the first quarter and we were 20 points down, which was decisive. When a team like Olympiacos leads you by 20 points, it is very hard to come back, because they keep control and use the 24-second clock. We were able to find the players who would fight and play with heart, like Voronov, Panin, Antipov, Parakhouski, Banic and Langford - a roster ready to fight. We have to realize that our starting five was not working well. We have had a really bad first quarter too many times and have to analyze what happened. After that, we fought until the end and got within 7 points. We made defensive mistakes and Printezis hit two big three-point shots and that was it." "It was a very good game from our side. I think we surprised Unics a little bit with a great first quarter, but also a great first half. We played very good defense and probably that was most important. We allowed a very good team, especially here in its home court, to score just 13 points in the first period. That gave us great rhythm on offense to shoot some open shots. Our rhythm was very good offensively and this is the reason for the great three-point percentage we had in the beginning. We discussed with our players at halftime that Unics would try to react for sure. We said that they would put us under pressure. This is exactly what happened; in the third period, we struggled a little due to Unics's tough defense, but after a while, we found our defensive effort and started to play better on offense in the fourth period. That gave us again a big lead. When the game went to 7 points, it was a crucial moment, but we started to play good defense. We scored in that moment some layups with Printezis and some three-point shots. I think we got the lead that was enough to win the game in the end. In general, I think we controlled the game and had one of our best performances. I tip my hat to our players for their great effort and great fighting spirit. 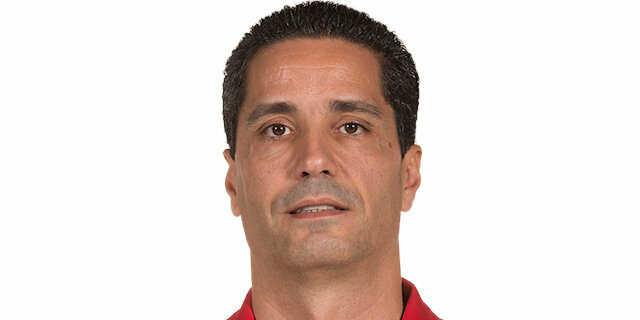 I want to thank all Olympiacos fans who came this far to support us." "We came out strong as a team, focused on defense. Keith Langford is a great player and we had guys rotating. Overall, we played great team defense. I am just really excited about the win. We have to get ready for the next game. My teammates just gave me the ball and Coach drew up great plays. I have been shooting the ball well, staying in the gym and it all paid off. Overall, it was a great team performance. Honestly, it was one of those nights. My teammates gave me the ball and come up with good screens. It was one of those night in which your teammates fins you and sacrifice when the hot man is on. Our big men had a great night, too. Kostas [Papanikolaou] and Papapetrou played good defense on Langford. Everybody had a good night and overall, it was a great win."